In finance, the central observation of technical analysis is that the price bar embodies all the supply-demand dynamics of the day and that a series of bars on a chart shows the evolution of the supply-demand dynamics over time. Some percentage of the time, the evolution is visible in the form of a trend. A downtrend is a series of down-day bars (a close lower than yesterday) characterized by lower lows and lower highs in a preponderance of the bars. The law of supply and demand states that for every security, you can find some price that persuades suppliers to part with it or buyers to purchase it. After a price is established through the execution of a real cash trade, traders have a baseline from which to track prices. Any transaction may occur at a random price, but not every transaction can occur randomly, or the market in that security would collapse. 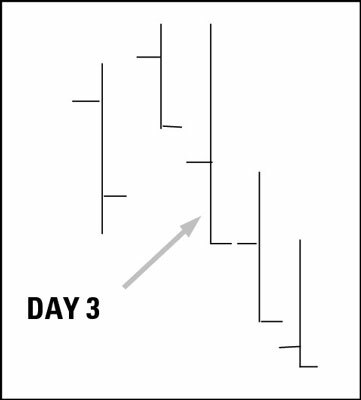 For example, in this figure, after the first day, each of these bars has a close lower than the close the day before. Day 3 has the same high as the day before, but a lower low. On Day 3, you start to get the idea that this may be the beginning of a downtrend. When identifying a downtrend, a series of lower highs is a good confirming indicator to the series of lower lows. Sellers see that new lows are occurring — somebody must know something negative about the security. Traders aren’t willing to hold a falling asset, and they unload it at ever-lower prices. Meanwhile, fans of the security can’t give it support at yesterday’s low — selling pressure is too great.